As long-time readers of Sustany®’s blogs may recall, last summer was an interesting time for the Tampa Bay area’s marine interests and their relationship with the Inter-American Sea Turtle Convention. The Inter-American Sea Turtle Convention, or IAC, is an international organization based on a treaty between fifteen Contracting Parties dedicated to the conservation of sea turtles and all of which are countries throughout the Americas. As Secretariat, Ms. Veronica Caceres heads the Convention; however, currently she presides as a “Secretary Pro-Tempore” because the Convention doesn’t have a permanent host location or hosting agreement. 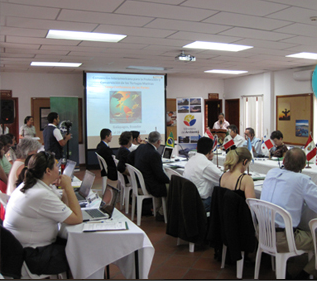 Last summer, the Convention met in the Galapagos Islands of Ecuador in the Sixth Conference of the Parties. There, one of the central points of debate and discussion was the Establishment of a Permanent Secretariat, which will most likely be achieved through a hosting agreement. There were a handful of countries offering proposals to host, including one from Peru, one from the Dutch Antilles, one from Nicaragua, one (added at the last minute) from Ecuador, and one from Stetson University’s College of Law, right here in the Tampa Bay community. Last year, the Sustany® foundation, interested in the possibility of the Tampa Bay area being a host for this international treaty organization that supports a sustainable cause, requested a blog series for their web site documenting the Convention proceedings. This summer, Stetson, in great part because it is a potential host for the treaty, invited the Seventh Consultative Committee of Experts to meet at the university. This group is one of the two committees under the Convention and it offers advice to the Convention about possible resolutions to outstanding matters or on how to proceed in their various conservation efforts. The Consultative Committee of Experts consists of one representative from each of the member nations, three representatives from non-government organizations, three representatives from the scientific community, and three representatives from the private sector. By inviting the Consultative Committee here to Tampa Bay for meetings and to participate in marine treaty discussions at Stetson, the University hopes the Convention will better understand our marine and conservation community and the strong support our community offers as a host for the Secretariat and the treaty. The Consultative Committee of Experts convened at Stetson for three days. While they were primarily conducting their reviews of potential and current IAC resolutions, they did take time to consider the surrounding area and the marine, research, transportation, policy, and conservation initiatives that could support them as a potential host. This series of blogs is to document the events surrounding the Secretariat and Consultative Committee’s visit to Stetson. Perhaps, in a year’s time, the Inter-American Sea Turtle Convention will have considered the Consultative Committee’s report and have decided to establish the Permanent Secretariat here. Along with the members of the committee, we may be reflecting upon this summer’s visit to Stetson and the Tampa Bay community as the deciding factor in their vote.